A flight from Dublin, the Chanel haute couture fashion show and the Eiffel Tower were all happily added this week's schedule. 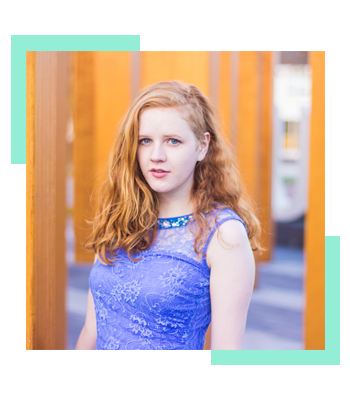 My friends and I hit Paris for two days and in this short amount of time we got to hang out with our good friend Sorcha and do a heap of touristy things, as well as immersing ourselves like locals, if only for a little while. Here's a little post about my trip, with a few iPhone photos too. Because I have so many photos, and so much to say about my trip, I thought it would be best to split the Paris posts, so expect another post full of pretty photos from my DSLR to go live over the weekend. 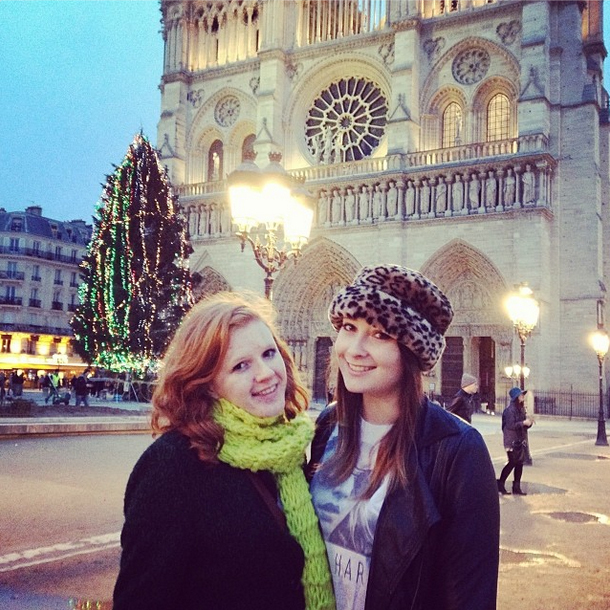 Myself and Caoimhe outside the Notre Dame. Also on my instagram. First on the agenda was style spotting outside the Chanel haute couture show, which was the highlight of the whole trip, as it was such a unique and exciting experience. We congregated with the Parisian fashionistas and celebrity spotters to watch the guests arrive with their sparkly Chanel invitation in hand. Although the guests who arrived at the entry we were manning weren't major celebrities (Lily Allen and the likes must have entered somewhere else) it was enough to be there for the buzz and to see what the guests were wearing. Plus I spotted Susie from Style Bubble, so that was exciting! We also visited three galleries in two days, which wasn't bad going at all! My favourite by far was the Centre Pompidou, it houses some amazing modern art, and I definitely have some new artists to research after seeing some incredible pieces. Plus, we spent some time in the Musée d'Orsay, I especially enjoyed its selection of pointillist paintings. Finally the Lourve is one of those must-see spots of Paris, so, with Paris newbies in the group, we couldn't leave it out. However, as I had already been there, and the art it showcases is mostly too classical for my taste, it was my least favourite out of the three. Regardless, each of the galleries that we visited were host to works of art which I found inspiring, and as a result I took an obscene amount of photos on my iPhone for future reference. 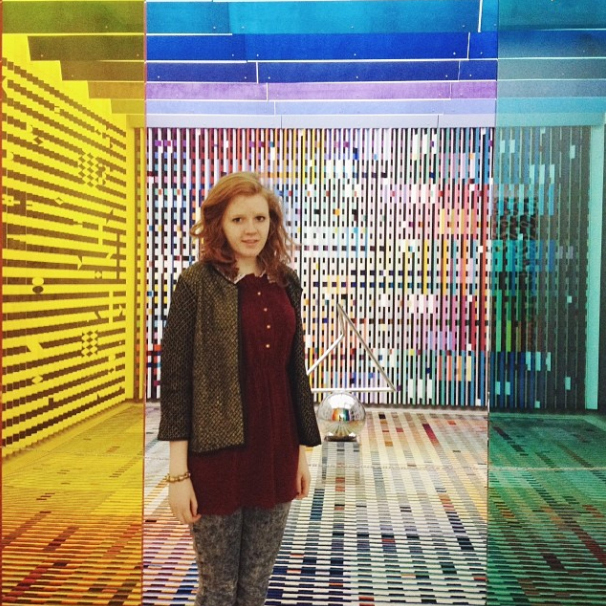 Next to an art installation by Yaacov Agam, at the Centre Pompidou. Also on my instagram. Of course, as tourists, the Eiffel Tower could not be missed, even though the weather was not ideal and the top floor was not open. We walked up countless stairs to reach the first and second floor. Yes, we walked up the Eiffel Tower. I am pretty unfit, so by the time we reached the second viewing point I was ready to collapse! The view was worth it, though! 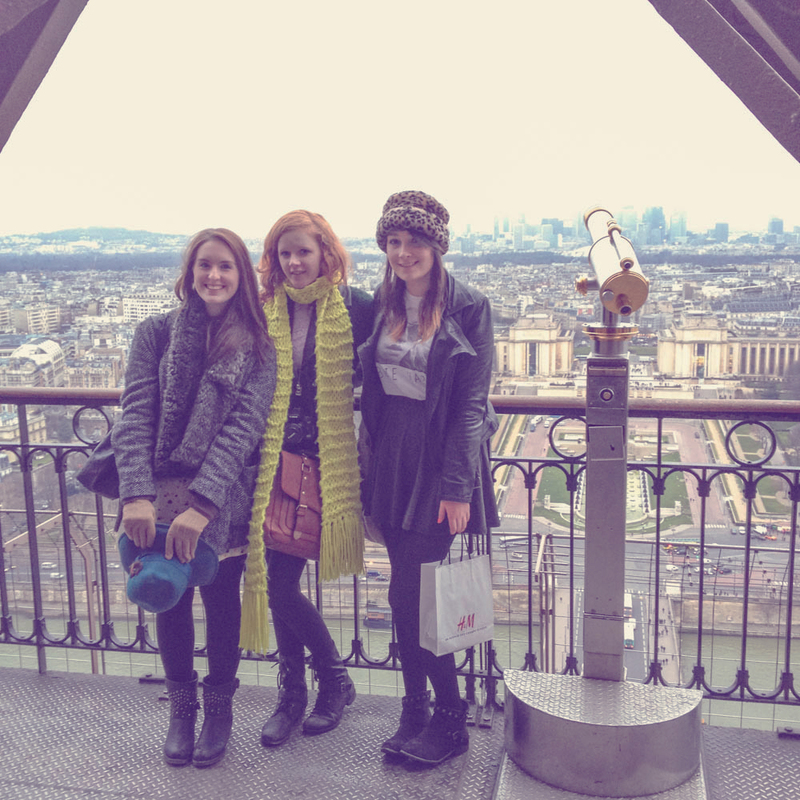 Sorcha, myself and Caoimhe on the Eiffel Tower. On our last night we treated ourselves with a late night snack at a local crêperie. A nutella crêpe in Paris has got to be the best midnight snack imaginable. 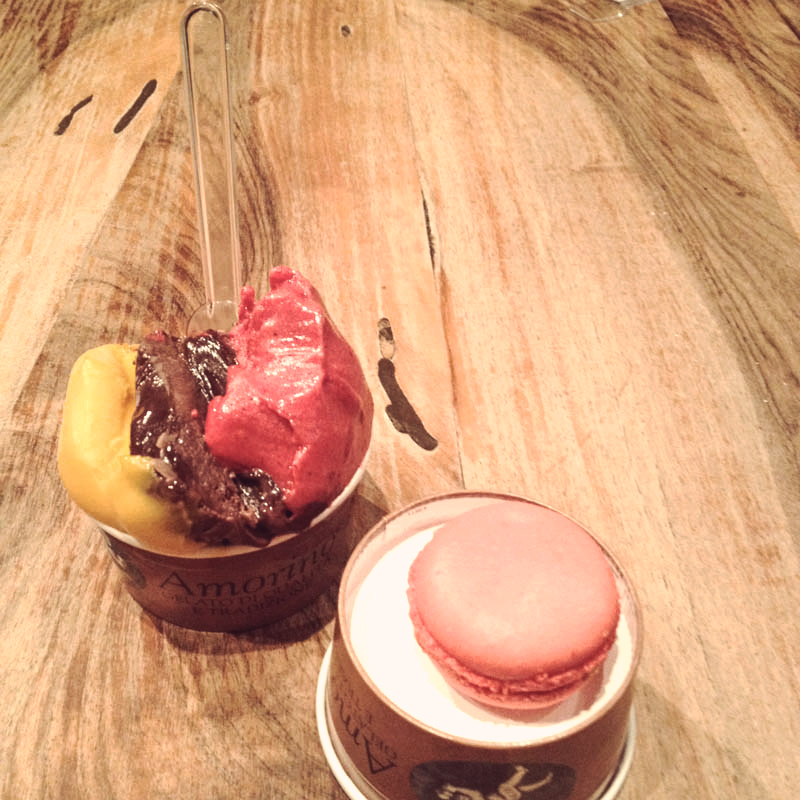 That night I also got a macaroon and three different flavours of ice-cream and sorbet. It's safe to assume that I didn't go hungry on my trip. Mango sorbet, dark chocolate ice-cream and raspberry sorbet with a raspberry macaroon. Divine. Between all the eating, gallery hopping and sightseeing, I got a chance to take a few style photos, of both myself and my friends. I'll be uploading some of the photos over the weekend so keep an eye on this blog! In the meantime, there's nothing more to say except "au revoir"! Your trip sounds like fun! We hope to see more photos soon.